This Commissioner’s Practice Note is relevant to all businesses that have dealings with contractors. Payments to independent contractors may be liable to payroll tax under the Payroll Tax Act 2007 (the Act). This practice note will assist customers to decide whether payments they make to independent contractors are liable for, or exempt from, payroll tax and whether the amounts should be included in their payroll tax returns. It explains the type of records they should keep about any exempt contracts. What is a “relevant contract”? It is a contract, agreement, arrangement or undertaking under which a contractor provides an employer with the services of a worker. The individual who performs the work may be the contractor or another worker engaged by the contractor. The independent contractor is deemed to be an employee. The person who receives the services is deemed to be an employer. Payments by the deemed employer that relate to the performance of work by the contractor are liable for payroll tax unless an exemption applies. Any part of the payments which are for materials, tools or equipment are not liable for payroll tax. the contractor engages 2 or more persons to perform the work. If an employer believes a particular contract is exempt, records must be kept to show that the exemption applies. Businesses may engage independent contractors who provide their own services, or the services of other workers, in the course of performing work or achieving a result. Payments made to independent contractors may be taxable if the contract or arrangement is a “relevant contract” for payroll tax purposes. This is because the definition of “wages” under the Act includes amounts paid or payable to a contractor for the performance of work under a relevant contract unless an exemption (called an “exclusion”) applies. you make payments to a company or trustee that employs the worker. The contract is primarily for the transport of goods in a vehicle provided by the contractor and the contractor’s services are ancillary to the transport of goods. More information about the application of each of these exemptions is provided below. If a payment under a relevant contract includes a non-labour component, such as payments for goods or materials, payroll tax only applies to the component that is attributable to work. The non-labour component should be deducted. You should also deduct the GST component of any payment to a contractor. An independent contractor is a person who is conducting their own business. bear the entrepreneurial risks associated with running a business. Liability for payroll tax on payments to independent contractors is dealt with in Sections 31 to 36 of the Act. Even if your contract with a worker defines them as an 'independent contractor', the worker may still be regarded as a common law employee depending on other terms of the contract. Read the public ruling on determining whether a worker is an employee (PTA038) for more information about the difference between an employee and an independent contractor. The Australian Taxation Office (ATO) has an employee/contractor decision tool you can use to help you decide if a particular worker is your employee or a contractor for payroll tax purposes. This is important in determining your payroll tax liability because the exemptions in the contractor provisions do not apply to employees. If you engage a worker under a contract of employment, your payroll tax liability is determined under section 13 of the Payroll Tax Act 2007 (“General concept of wages”). The exemptions under the contractor provisions do not apply. If your worker is not engaged as an employee and the employment agency provisions do not apply, you must consider the facts and circumstances applying to each contractor to decide whether the contractor provisions apply. If none of the contractor exemptions apply, payroll tax is payable on the labour component of the amount paid or payable to the contractor, after excluding GST. A contract is exempt if it is primarily for the supply of goods, and the services provided by the contractor are ancillary to the supply of goods. This exemption will apply if the main purpose of the contract is the supply or use of goods. This usually means the amount you pay for goods, or for the use of goods, is more than 50% of the aggregate payments under the contract. The value attributed to the contractor’s services and to the goods or their use must be reasonable market rates. “Goods” has a broad meaning and includes any tangible article, whether portable or fixed to something, and whether intended for personal, domestic or commercial consumption or use. It includes commodities, material, merchandise, and equipment. If the value attributed to the goods or to their use is less than 50% of the contract value but you believe the main object of the contract is the supply or use of goods, you should seek a private ruling from the Chief Commissioner before claiming the exemption. Budget Air Pty Ltd manufactures, sells and installs air conditioners in commercial premises. ABC Pty Ltd purchases an air conditioner from Budget Air Pty Ltd for $5,000. Budget Air Con Pty Ltd also installs the air conditioner at a cost of $1,000. The installation services are considered ancillary to the supply of the air conditioner and payments under the contract are not taxable. Pay TV Pty Ltd provides a subscription television service and engages contractors to install equipment in subscribers’ premises, to provide the services. The equipment, which includes satellite dishes and set-top boxes, remains the property of Pay TV Pty Ltd.;Contracts between Pay TV Pty Ltd and contractors who install the service are not eligible for this exemption, regardless of the value of the equipment, because the installation of the TV service, not the supply of goods, is the main purpose of the contract. You should maintain a copy of the contract, invoice, purchase order or quote, disclosing the value of goods and/or equipment you purchased under the contract as well as the total value of the contract. If your records do not disclose the value of the goods, you should maintain other evidence of the value of the goods at the time of the transaction, such as a price list from the supplier of the goods. This exemption applies when an employer engages an independent contractor to provide services that are not ordinarily required in the employer’s business during a financial year, and the contractor conducts a business of providing similar services to the public generally. Services are “not ordinarily required” if, during a financial year, that type of services are not usually required at all. An accounting business acquires a new office building and employs an independent gardening contractor to establish lawns and garden beds. The gardener has other contracts with other businesses to establish or maintain their gardens. The contract is exempt because during a financial year the accounting business does not normally require the services of a gardening contractor. (However, this exemption would not apply if you employee a gardener on a regular basis to maintain the garden). You will need to demonstrate that you do not normally engage employees or contractors to perform the particular type of services. In many cases, this may be self-evident, but you still need to keep sufficient information about the work performed by the contractor to demonstrate that the type of services actually performed under the contract are not normally required by your business during a financial year. a declaration signed by or on behalf of the contractor attesting to the fact that it provides similar services to other businesses, and derives substantial income from those other businesses;our access to ATO information allows us to check such declarations. If we are not satisfied that the contract is exempt, we may check information we are able to access from other Government agencies. For example, we are able to access information about contractors held by the ATO, showing the income declared by the contractor for income tax purposes. If your contractor’s annual income is substantially higher than the remuneration your business pays to the contractor during the relevant financial year, that shows your contractor provides services to the public generally. This exemption applies if you engage a contractor that provides services of a type that is usually required by your business for less than 180 days in a financial year. However, if your business regularly or usually uses this type of service for at least 180 days each year, the exemption does not apply. You should maintain records describing the type of services supplied by the contractor. You need to be able to demonstrate that your business usually requires the same or similar services for less than 180 days in most financial years. An engineering business engages an independent gardening contractor to maintain the lawn and gardens surrounding its business premises. The contractor works for 2 days each week, ie for 104 days per year. The business does not normally employ any other gardeners. The contract is exempt. A business engages an independent accounting contractor to maintain accounting records and tax returns. The contractor works for 2 days each week. The business does not employ accountants nor does it usually require any other accounting services. The contract is exempt because the accounting services are ordinarily required by the business for less than 180 days in a financial year. Therefore, payments made to the accounting contractor are exempt. A building company engages a full time accountant to maintain its accounting records, and also employs an independent accounting contractor for 3 days per week. The contract is not exempt under this provision because it requires accounting services throughout the year. If you wish to claim this exemption, you will need to demonstrate that the services provided by the contractor are normally required by your business for less than 180 days each financial year, and the services were required because of special circumstances. If you believe a particular contract qualifies for this exemption, you should ensure that you keep a record of the type of services received under the contract, and demonstrate that your business does not usually require the same or similar services. This could be recorded in the contract itself, on the invoice provided by the contractor, or in your payment records. Read the public rulings for more information: contractors 180-day exemption (PTA020) and What constitutes a day's work? (PTA014). If a contractor is engaged by your business under multiple contracts, and the work is performed by the same person, the contracts are exempt only if the total number of days worked all of the contracts does not exceed 90 days during the same financial year. If you engage multiple contractors to undertake similar tasks, but the same individual performs the work under those contracts, the exemption will only apply if the total number of days worked by that individual does not exceed 90 days. Each day on which your contractor provides services counts as 1 day e.g. working for 1 hour on a particular day counts as 1 day for the purposes of this exemption. A building company engages full time carpenters, and also employs an independent carpentry contractor to undertake quality assurance work and fix faults on each of its construction sites. The contractor works for 1 day per week. The contract with the independent contractor is exempt because the contractor provides services to the business for less than 90 days in the financial year. For example a, if the independent contractor was employed for 2 days per week (that is, more than 90 days in the financial year) the contract would not be exempt under this provision. (However it may be exempt under another exemption eg see exemption 5). A building company engages Bricklayers Pty Ltd to lay bricks. The physical bricklaying work is performed by John Smith. After working for 80 days, the building company ends its relationship with Bricklayers Pty Ltd, and hires John Smith to lay bricks for 50 days in the same financial year. As John Smith performed the work under both contracts and worked for a total of 130 days during the financial year, neither contract is exempt under this provision. If you claim this exemption you must keep records which show that your contractor worked for your business for 90 days or less during a financial year. an attendance record of the days on which your contractor actually attended your business premises or work site. If you are unable to determine the number of days your contractor worked from information on the invoice or contract, you may use a “replacement” method using the industry pay rates to determine the estimated remuneration you would expect to pay for 90 working days of the type of service provided by your contractor, having regard to the contractor’s qualifications or expertise. You can use relevant award pay rates published on the Fair Work Australia website. You compare this amount to the payments you made to the contractor to determine whether the contract is exempt. The replacement method is explained in Revenue Ruling PTA 035 v2: Contractors: 90-day exemption. Read the following public rulings for more information: Contractors 90-day exemption (PTA035), What constitutes a day's work? (PTA014), Contractor deductions (PTA018), Contractors – Labour and Non-Labour Components (PTA019). A contract is exempt if your contractor ordinarily provides similar services to the public during the relevant financial year. You need to show us that during the relevant financial year your contractor ordinarily provided similar services to the public generally. Your contractor must be offering similar services to other principals in the course of conducting a genuine independent business. The characteristics which indicate that your contractor conducts an independent business are listed in Revenue Ruling PTA021: Exemption for contractors ordinarily rendering services to the public. your contractor provided services to your business for no more than 10 days per month during the months the contractor worked for you. A building company engages an independent plumbing contractor to carry out regular work during the financial year. The plumbing contractor is free to accept other work, advertises its business in the yellow pages or on social media, and performs plumbing work for other unrelated businesses. The contract is exempt under this provision. 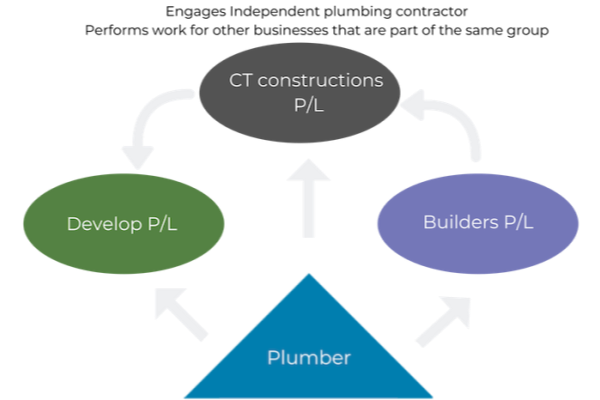 A building company engages an independent plumbing contractor to carry out plumbing work. The plumbing contractor also undertakes plumbing jobs for other businesses, but all of the businesses are all part of the same group for payroll tax purposes. The contract is not exempt under this provision because the contractor does not provide services to the public generally. Real Estate Agency A Pty Ltd (Agent A) engages Real Estate Agency B (Agent B) to help sell property. Agents A and B enter into a conjunction agreement whereby Agent A pays Agent B a proportion of the commission earned on the sale of a property that Agent B assisted in selling. If Agent B worked exclusively selling properties for Agent A, then this exemption does not apply. However, if Agent B enters into other conjunction agreements with other Agencies (unrelated to Agent A), this exemption applies. evidence which demonstrates that the contractor derived substantial income from providing similar services to other customers or businesses e.g. a declaration from the contractor that the payments from your businesses represented less than/no more than x% of its income for the relevant financial year. We use data provided by the Australian Taxation Office to check claims for this exemption. The taxable income declared by the contractor should be significantly more than the total amount paid to the contractor by the employer. An exemption applies if your contractor conducts an independent business and engages 2 or more persons to provide your business with services under the contract. The work performed by each of at least 2 individuals who perform the work must be directly related to the work required under the contract and must constitute a significant proportion of the total amount of work required by the contract. The exemption does not apply if the contribution of one of the individuals is de minimis, that is, if it is an insignificant proportion of the total work performed under the contract or contracts during the financial year (see for example, Novus Capital Ltd v Chief Commissioner of State Revenue  NSWCATAD 72 at paragraphs 285 and 286). The requirements to qualify for this exemption depend on whether the contractor is a natural person, a partnership of natural persons or a company. If your contractor is a partnership, 1 of the 2 or more persons who provide services to you may be one of the partners but at least 1 must be an employee or contractor engaged by the partners. If your contractor is an individual, the contractor may be 1 of the 2 workers who perform the work but the other worker must be engaged by the contractor. If your contractor is a company or trustee, 2 or more employees or contractors engaged by the company or trustee must perform the work. XYZ Shutters Pty Ltd engages Installations Pty Ltd to install shutters. Installations Pty Ltd only has only 1 full time employee to undertake the installation work, but it usually engages casual workers to assist its employee with the installations. The contract is exempt because 2 or more employees of Installations Pty Ltd usually perform the work. 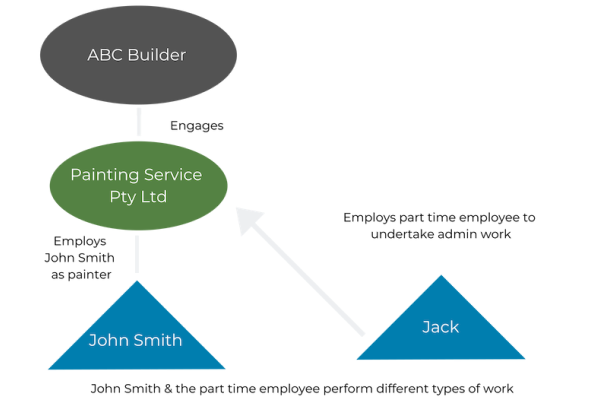 ABC Builder engages Painting Services Pty Ltd to provide painting services. Painting Services provides the paint and painting equipment and employs John Smith as a painter. Painting Services Pty Ltd also employs a part time employee to undertake various administrative tasks which are not connected to the provision of painting services, such as maintaining business records. The contract is not exempt under this provision because the services provided by the part time employee are not services of the same type as the services performed by John Smith. An Australian Financial Services Licensee (AFSL1) engages an individual Authorised Representative (AR1) to provide financial services on its behalf. Due to its workload, AR1 refers some clients to another Authorised Representatives (AR2) engaged by AFSL1. 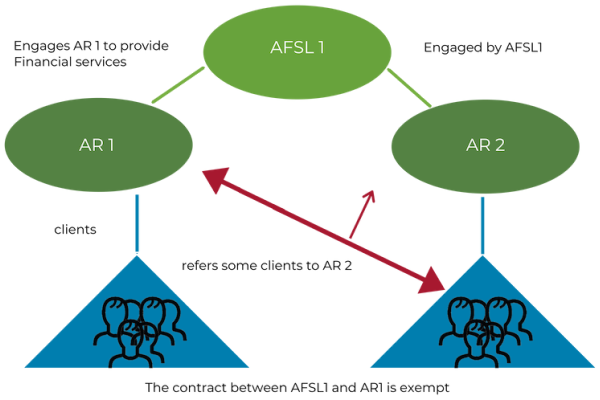 The contract between AFSL1 and AR1 is exempt under this provision. An Australian Financial Services Licensee (AFSL2) engages an Authorised Representative (AR2) to provide financial services on its behalf. 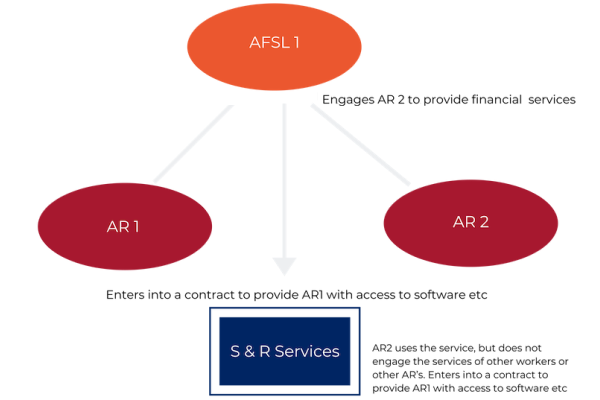 AFSL2 enters into contracts with a software and a research business (S&R Services) and provides its ARs with access to software systems and investment advice provided by S&R Services. AR2 uses these third party resources, but does not engage the services of any workers. 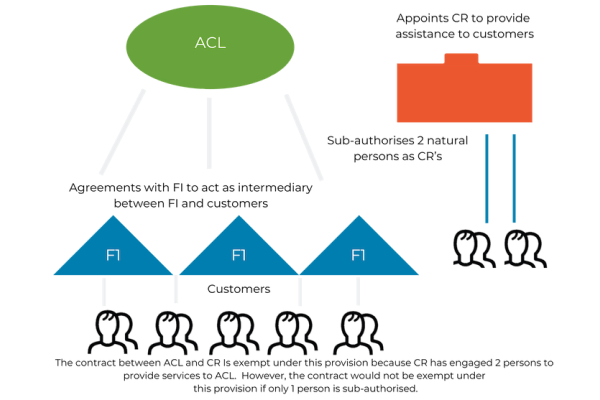 The contract is not exempt because the third parties who provided the software systems and investment advice were engaged by AFSL2. ACL, the holder of an Australian Credit Licence under the National Consumer Credit Protection Act, has entered into agreements with a number of financial institutions to act as an intermediary between the financial institutions and consumers who are seeking loans. ACL appoints CR as a Credit Representative to provide credit assistance to consumers. CR sub-authorises 2 natural persons as credit representatives, with the approval of ACL. The contract between ACL and CR Is exempt under this provision because CR has engaged 2 persons to provide services to ACL. However, the contract would not be exempt under this provision if only 1 person is sub-authorised. evidence provided by the contractor indicating the contractor employs workers, such as details of the contractor’s workers’ compensation insurance policy. 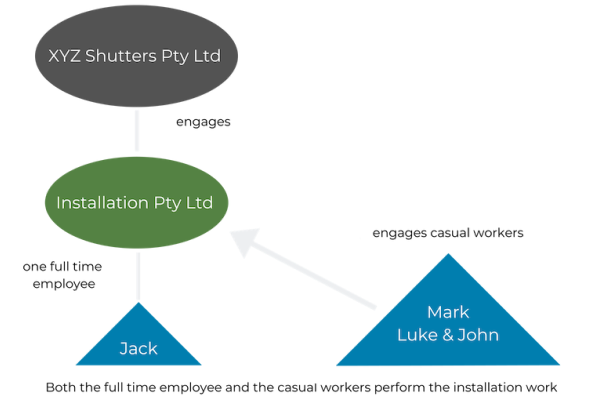 We have access to ATO and State Insurance Regulatory Authority records, and we may check whether their information is consistent with your claim that the contract is exempt. “Goods” has a wide meaning and includes tangible items, articles, commodities, material, and merchandise, including the return transportation of packaging and spoiled goods. Services are ancillary to the transport of goods if they are part of the work required to be performed to undertake the conveyance, including tasks undertaken prior to loading and after unloading the goods. Such services include driving the vehicle to pick up the goods and return the vehicle or to drive to the next conveyance job; loading and unloading the vehicle; repairs to the vehicle during the conveyance; and conducting a stocktake either before or after conveying the goods. The contractor must provide the vehicle used to transport the goods, but the vehicle may be hired, leased or borrowed, as long as it has not been hired, leased or borrowed from the person or business for whom the goods are transported. The employer or business must not make a contribution, directly or indirectly, to the capital or running expenses of the vehicle. 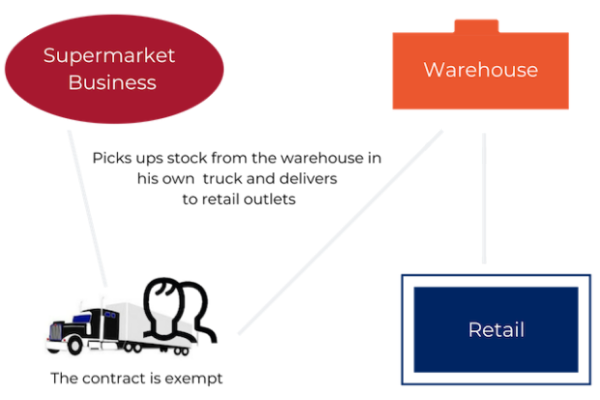 A supermarket business engages an independent contractor on a full time basis to pick up stock from its warehouse and deliver it to its retail outlets. The contractor supplies the truck used to transport the stock. The contract is exempt. 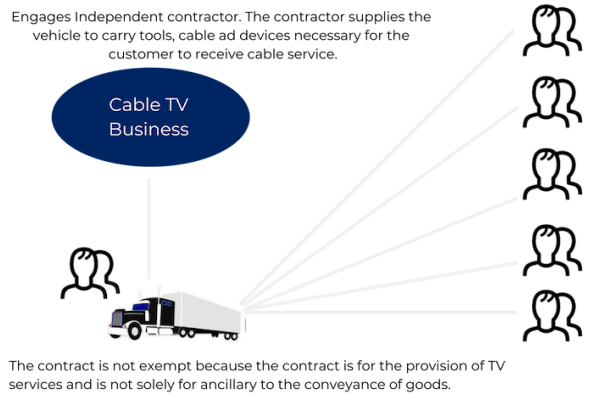 A business that installs cable TV services engages independent contractors to install the equipment necessary to allow customers to receive the services. The contractor supplies a vehicle to carry tools, cable and devices necessary for the customer to receive the cable service (eg satellite dishes). The contract is not exempt because the contract is for the provision of TV services and is not solely for or ancillary to the conveyance of goods. You should keep a copy of the contract, invoices, agreement or consignment notes provided by the contractor when your goods are picked up or delivered to the destination. You should also record the registration details of the vehicle used by the contractor. Read the public ruling on the payroll tax exemption for payments to owner-drivers (PTA006) for more information. A payment under a relevant contract is taxable to the extent that the payment is for labour. Where the payment includes a component for labour and also a non-labour component, such as materials, tools, equipment, or a vehicle, you may deduct the amount attributed to the non-labour component. If your contract separately identifies the labour and non-labour components of payments, the amount paid for labour is taxable, provided the components reflect reasonable market rates. If a contract does not distinguish between the amounts payable for labour and non-labour components, you may deduct a proportion of the total payments as specified for particular types of contracts outlined in public ruling PTA018 (Contractor deductions). If your contractor provides services which are predominantly of a type specified in the ruling, or if you provide a similar type of service, you may apply the percentage deduction specified for that type of contractor without seeking the Chief Commissioner’s approval. For example, the deduction permitted for electricians may be applied to contractors installing electronic equipment or performing services where electrical work forms a substantial component of the work. If a non-labour component is specified in your contract but it is higher than the rate specified in PTA018 for the particular industry, you must seek the Chief Commissioner’s approval of the higher rate before using it. The deduction specified in PTA 018 for wall and floor tilers is 25%. If you are able to prove that a higher deduction is warranted because the tiler is providing expensive tiles under the contract, you should apply for the Chief Commissioner’s approval of the higher deduction. Evidence such as invoices of the actual non-labour costs actually incurred by the tiler must be provided. If your contractor provides services that are not the same or similar to an industry specified in PTA 018, or if you have calculated a non-labour component which is higher than is specified in the ruling, you should apply for a determination by the Chief Commissioner (see PTA019: Contractors – Labour and Non-Labour Components). You may be asked to provide evidence of the actual or estimated costs incurred by your contractor to justify the deduction you wish to claim. Acceptable evidence includes invoices for the particular materials provided by your contractor. If your contractors provide their own tools and/or equipment, you can claim a proportion of the costs of such equipment using depreciation rates accepted by the Australian Taxation Office. Another acceptable method is to use the award or market rate of remuneration paid to employees with similar qualifications or skill levels performing similar work to your contractor. Award rates can be obtained on the website of Fair Work Australia. Read the public ruling on Contractor deductions (PTA018) and Contractors – Labour and Non-Labour Components (PTA019) for more information. If your contract satisfies the requirements for an exemption, but we believe the contract results in a reduction or avoidance of payroll tax, we may disregard the contract and treat the payments for the services of the contractor as liable under the anti-avoidance provision.